When my boy was very young – maybe four or five years old – we had just completed our grocery shopping when he noticed a man in a green coat feeding dollar bills into a machine that then shot out shiny tickets. He asked me what the man was doing and what the machines were for and I thought, Aha! Now this is a teachable moment if I have ever seen one! I licked my lips, certain that this would be, without a doubt, the lesson on gambling that my son would never forget. I explained to my littlun that the man in the green coat was buying scrach-off tickets. 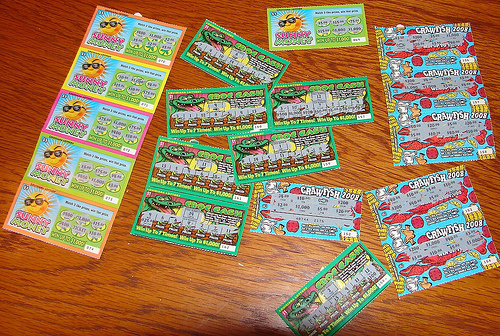 That each ticket had a different price, and that the man had a chance of winning a little money (as in the same amount as the cost of the ticket), a lot of money (in this case, up to $500 smackers) or he could lose everything. For those of you who remember the ‘80s television sit-com, Family Ties, you may recall Alex P. Keaton, played by Michael J. Fox. “Alex,” was a high school student who had a passion for economics and wealth. A proponent of supply-side economics, Alex’s heroes were Republicans Richard Nixon and Ronald Reagan. His favorite television show was Wall $treet Week and he was an avid reader of the The Wall Street Journal. My son has always had a little Alex P. Keaton in him. Maybe more than a little. For his birthday this year, he wants Apple stock. But I digress. Anyway, at age 5, my child was positively enthralled by the machine, the lights, the magical production of a shiny ticket which he now understood could win him big bucks. His eyes were wide. “So he could win $500?” my child asked, pointing at the man in the green coat. My child was in a zombie-like state, drifting over to the man and the machine. I did not have to ask twice because my child was now running towards the man in the green coat. After introducing my son and myself, I asked the man in the green coat if my child could ask him a few questions, and he was more than agreeable. My son had a million questions. Boy: How many tickets did you buy today? Boy: How much is each ticket? Boy: How many times a week do you play? 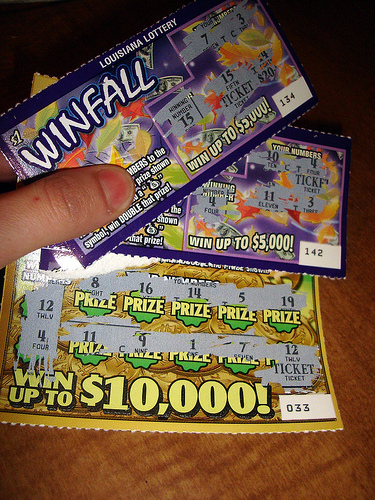 Boy (incredulous): You spend $20 every day on scratch-off tickets? Boy: Do you ever win? Boy: What’s the most you’ve ever won? Man: It used to be on a commercial for the New York State Lottery. Man: It’s another gambling game where you place a bet on numbers. Boy: Do you play that? Man: Sure do. Once a week. Boy: Wow! You must be rich! How much money do you spend in a week on all these numbers games? Here, I apologized profusely to the man in the green coat as boy was probing relentlessly about his finances and what he did for a living so he could afford to spend $20 a day on “these numbers games.” The older man graciously dismissed my apology with a wave of his hand. Man: I suppose one day when you are bigger, you’ll be able to figure out how much money I spend in a week, even a year, on these tickets. Boy (nodding): You gonna scratch now? Man: Yup. You wanna watch? Boy didn’t need to answer. He stood on his tippy-toes at the service desk, watching the man in the green coat burn through his scratch-off tickets with his “lucky” quarter in hand. I was thinking to myself, if you usually lose, wouldn’t that be an “unlucky” quarter? Maybe you should pick a new coin. In a short time, the man in the green coat was down to his last ticket, which he kissed dramatically. I am pretty sure he did this for my son’s benefit. But whatever. I didn’t care. I was so happy. I had my car lecture ready to go in my head. It went something like this: You see, son, the man in the green coat spends $20 a day on scratch-off games, which is $140 per week. That’s about $560 per month, not counting whatever he pays for lottery tickets. That’s a lot of money, I would say. I was prepared to point out that our grocery bill that very day had come to $146, so that man’s habit was just under a week’s worth of groceries for our family of three. I was prepared to discuss car payments and mortgage payments and savings accounts, the money market, the stock market, 401K plans, stocks and bonds. He leaned over and showed my son the three matching numbers lined up in a row. “Five hundred dollars!” he said, “Kid, you are my lucky charm!” he declared with a wink, “What time can you be here tomorrow?” Then he wandered off to stand in the line, I assumed, to collect his winnings. My soon-to-be 11-year old has no recollection of this event whatsoever, but he did recently use his own $5 to purchase a raffle ticket that a friend was selling. I don’t mind him supporting his buddy’s youth hockey team, but I kind of hope he doesn’t win. If he does, he might start asking for a trip to Vegas for his 11th birthday. Have you ever had a teachable moment go horribly awry? This entry was posted in Family, Memoir, Parenting and tagged Children and Gambling, Gambling, New York State Lottery, Teachable Moments Gone Wong, Teaching Children About Gambling, Teaching Children About Money, Teaching Kids Fiscal Responsibility. Bookmark the permalink. Hee hee – that is funny. Your son radiates luck. Which does not mean he’ll win any lotteries himself – but those standing next to him may. Ha ha. Maybe you should take him to Vegas… 😉 My husband likes his scratch-offs and just as I was telling him to quit wasting our money on them – bammo! He wins a thousand bucks. I’m sure we’ve lost it all by now, but he’ll keep playing. What can you say to something as true and awful as that? I think I laughed and I cried at the same time. Okay, I think I just peed in my pants a little. January 1997. Returning from mother-in-law’s surprise birthday party with wife and three kids in tow. Changing planes in Reno. We exit Plane 1 to what seems like a casino, jackpots everywhere in the boarding lounge. The kids, ranging from 7 to 12, grow gaga-eyed when they see all the slot machines. Some version of “Can I have some money dad? Can I? can I? Can i?” came from all three of them. A teaching moment! I explained that only adults are allowed to play these games. Unlike video games, you can win or lose real money. And the way the slot machines are made, the owners of the machine win almost all of the time, so if people aren’t careful they can lose a lot of money. Some disappointment, but the kids are okay with the explanation, and I should have stopped there. I didn’t. Reaching into my pocket, I found four nickels, and told the kids, “Look, I’ll show you.” I walked up to a nickel slot, and one at a time, plugged in a nickel and pulled the arm. Nothing came up the first time. Or the second, or third. “See?” I said as I dropped the fourth nickel into the slot. I pulled the handle. Suddenly there were lights flashing and an alarm blaring, and 800 nickels came pouring down the chute. They filled two buckets. So you feel my pain. Or felt it, but remember it like it was yesterday. Sister won 4 million! It changed her! I will pass! I would rather have you all then be lonely! Whatever! I am good! For as long as I can remember (although my memory may be fuzzy for reasons that will become crystal clear in short order), I have had a small obsession with Q-Tips. I like to put them in my ear as far as possible, as close to my brain as I can without causing what I assume would be very serious, permanent damage. Even as a youngling, I would sneak some “white gold on a stick” multiple times per day. My mother, of course, was horrified. “You’re going to hurt yourself!” she would wail. So, because she was deeply, maternally concerned — and because my doctor visits were covered by our insurance — my mother dutifully dragged me to my ever-so-friendly pediatrician, Dr. Francis. With that, Dr. Francis took out her ear-o-meter (I don’t know what that thing is called), and peered deep into my ear canal, analyzing every last nook and cranny. Puzzled, she checked the other ear. Then, back to the first. I guess you can be thankful that you have a lucky son! Haha! I don’t really see how this is a teachable moment gone wrong. This man has been spending all this money on gambling for how many years? Sure, he won $500 this time…but he spends more than that in a month. It’s not like he’s coming out ahead here. Hit submit too soon… It’s also a good time to explain confirmation bias, and how you have to take all the evidence into account when making an opinion or a decision. The same(ish) thing happend to me with my daughter in Vegas. We were standing with my father in line for a show, and she was watching the slots. Dad gave her two quarters to give to me to “prove” that you always lose. 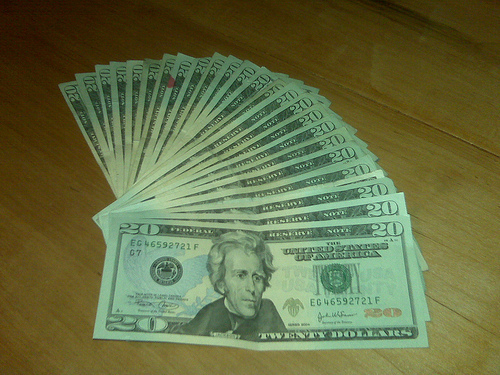 I came back with $20, lol! So he taught her to put most of it aside and gave me the same two quarters back. I came back with about $5, this went on and on! I lost the two quarters eventually, but by then she had about $45, lol. She did learn the lesson though, she often talks about going to Vegas when she is older, but it is always about the shows, and about having a “budget” for the games. I am just catching up on my blog reading. This is hilar! Your kid is a lucky charm. I have read so many of your posts but I have to say that this one is by far the best. I now would like you permission to “tag” this to my own blog because you’ve given me a great idea for my next post which, in turn might just generate more traffic back to yours.